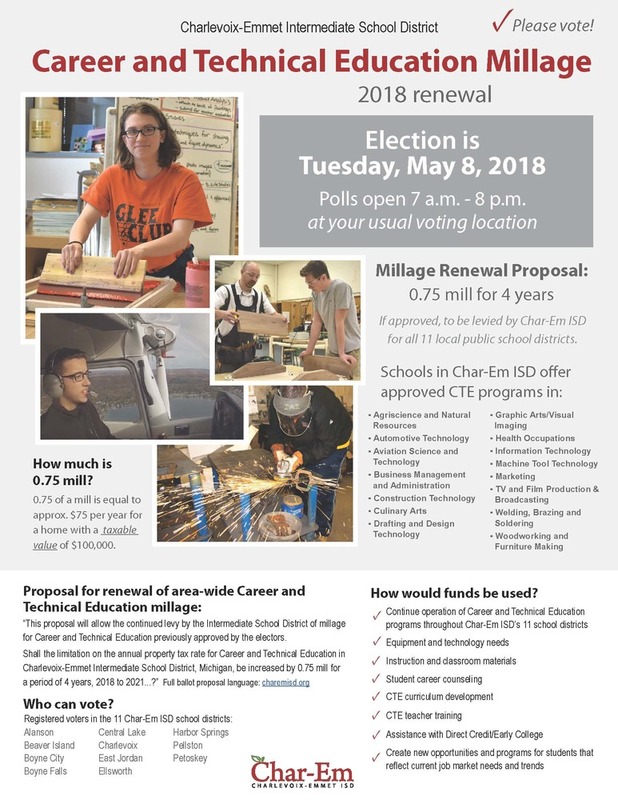 Voters throughout Char-Em ISD will be asked on May 8, 2018 to renew the Career and Technical Education millage for another four years. The 0.75 of a mill funds vocational programming throughout the ISD’s 11 districts. Along with its local district partners, Char-Em offers 42 programs in all ISD schools. More than 1,500 students throughout Char-Em participate in CTE programs. If approved, funds would be used to continue operation of Career-Tech programs throughout the ISD; for equipment and technology needs and instruction and classroom materials; student career counseling; CTE curriculum development; assistance with Direct Credit/Early College; and to create new opportunities for students that reflect current job market needs and trends. On May 8, polls will be open from 7 a.m. to 8 p.m. at your usual voting location. For further information about the millage renewal, please view the accompanying flyer.